OOoh nice review! I’ve read mixed reviews on this one as well, but still have plans to read it because I was too intrigue to pass it up! Though, I’m usually not a fan of comparison books. When people say it’s like “this other book”. Though I’ve learned in my time of talking to authors and such, publishing is a slow business. It’s possible that an author whose book is similar to Author A’s wrote their book around the same time, but publishing processes took longer, finding agents, finding publishers, editing, rewrites, etc…that by the time Author B’s book came out, it’s been some years or so since Author A’s book. Then it seems everyone thinks Author B’s book is too similar to Author A’s. Though that’s just one scenario! Obviously there are times when Author B was inspired by Author A and maybe used a few too many of the same tropes. But I digress! LOL! I could talk endlessly on this topic with other readers. Though my own memory regarding books tends to fade as I read more and more. And once a series is completed, the details really start to get lost! This still sounds like an intriguing read! One I hope to get to soonish! I just bought one of the prequel novellas and am trying to figure out if it’s one I should read before the book, or if it’s better to read it afterwards, even though it’s a prequel! LOL! Initially the parallels to other books in the genre were noticeable but then I reached a point where they didn’t bother me too much. I didn’t feel like I was reading a carbon copy of any one book which made it easier to get into. I’ve come to the point in my reading where most books within a genre share common elements and to just deal with it. The politics of this book were my favourite part…and that ending! I really enjoyed this book overall and am excited to see what happens next! I haven’t read this one yet, but I had the same issue with Awakening by Shannon Duffy. The book was good, but it felt like a lot of the parts were taken from other dystopian books I had already read. I can see where you get Shadow and Bone from in this one. I felt more so The Hunger Games meets The Selections…which is the weirdest mashup ever. I thought it was a pretty good read, but nothing really stood out to me. The ending definitely threw me for a loop though! I really enjoyed this book too. It kept me fully engaged, which is what I’m really look for with a book like this. I’ll definitely be reading future books in the series. This is exactly what I was afraid of. All the hype has been good, but nobody has addressed just HOW similar it is too all these other books. 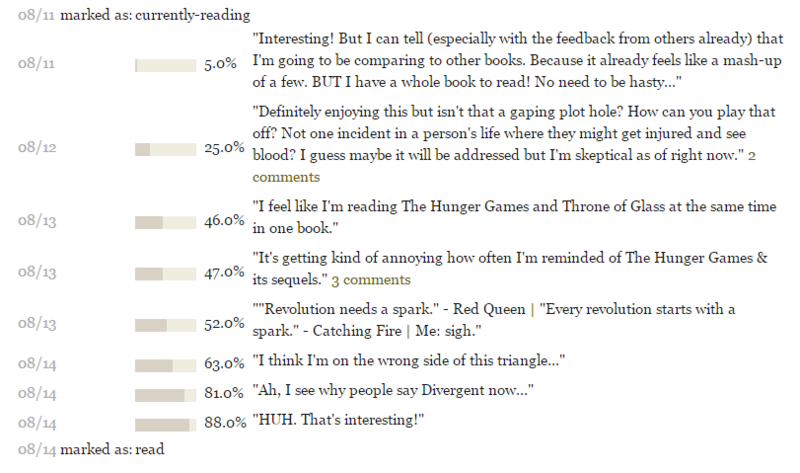 I’m not huge on dystopias, but of course I love any YA that’s written with compelling characters and a strong story. I don’t think this book is for me, and I’m glad to finally see someone talking about how quintessentially dystopian it is. I have heard about this one seeming so similar to other books. And even though that is a huge turn off for me, the hype is so big I just want to try this one and see what I think for myself as well. It sounds like it will generally be a good read and most people are shocked by the ending which does give me some hope as well. Let’s hope the sequel can be a bit more unique!